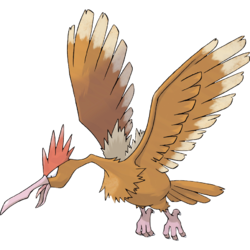 Fearow in game: 581 Who? Important notice! Pokemon Fearow is a fictional character of humans. Fearow (Japanese: ????? 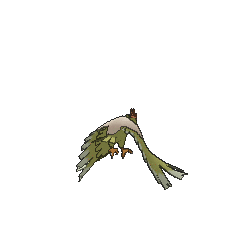 Onidrill) is a dual-type Normal/Flying Pokémon introduced in Generation I.
Fearow's large wings and stamina allow it to fly for an entire day without landing. It will shoot upward, and then dive down to catch prey. Its long neck and beak allow it to pluck prey from both land and water, and it will even catch tiny insects that hide underground. Fearow is found in wastelands and desolate fields. 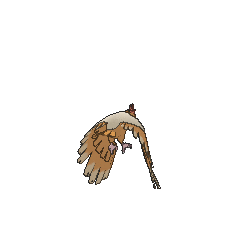 The Spearow who attacked Ash in the first episode evolved before Pallet Party Panic. Pidgeotto evolved into Pidgeot to defeat it. It reappeared in a flashback in Fighting Flyer with Fire. Skyler owns a Fearow which helped him pull his balloon in the balloon race and driving Team Rocket away in The Big Balloon Blow-Up. Two Fearow appeared under the ownership of Tyson in Talkin' 'Bout an Evolution and Rage Of Innocence. Rico, the Pokémon poacher, owns a Fearow in A Poached Ego!. In Pokémon Ranger and the Kidnapped Riolu! Part Two, J's client used a Fearow to escape from Officer Jenny, Ash and his friends. A Fearow appeared in Adventures in Running Errands! where it stole Chespin's purse. Later on, it was chasing Chespin and Bunnelby to try steal the purse again, but they took care of it while digging up a hole to flee. Fearow was first seen in a Pokémon Center in Sparks Fly for Magnemite. A Fearow appeared in Princess vs. Princess competing in the Queen of the Princess Festival contest. In Mewtwo Strikes Back, a Trainer tried to ride a Fearow to New Island. This Trainer never turns up on the island, unlike the others who set out. Mewtwo also uses one to scout for powerful Trainers. A Fearow appears in The Battle of the Badge and Lights, Camera, Quack-tion. Multiple Fearow also appeared in the second original series movie, The Power of One. Multiple Fearow make an appearance in Don't Touch That 'dile. Three Fearow briefly appeared in The Psychic Sidekicks! where they came out of the blue scaring the gang unintentionally. A Fearow attacked and injured a Pidgey named Ken in Carrying On!. Ash's Noctowl drove it away after hypnotizing it making it believe that Noctowl was a Charizard. A Fearow attacks several Pichu in The Apple Corp!. Ash's Pikachu drives it away after zapping it. A Fearow attacked Team Rocket in Freeze Frame. 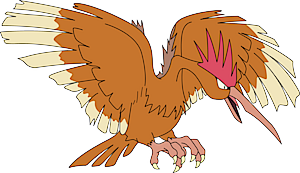 A Fearow was one of the Pokémon that fought in a battle as seen in a flashback in Pop Goes The Sneasel. A Fearow also appeared in Pinch Healing!. Pokémon Ranger Jack used his Capture Styler to capture a Fearow to help Pikachu recover the Manaphy Egg stolen by Team Rocket in Pokémon Ranger and the Temple of the Sea. Paul attempted to catch a Fearow in A Maze-ing Race!. By the end of the episode, it is unclear whether or not he succeeds. Multiple Fearow made a brief cameo in Giratina and the Sky Warrior. A Fearow appeared in Pursuing a Lofty Goal! as one of the participants of Squallville's PokéRinger competition. Several Fearow appeared in Frozen on Their Tracks!. 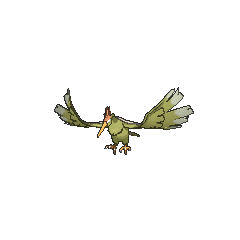 Another Fearow also appeared in Historical Mystery Tour!. 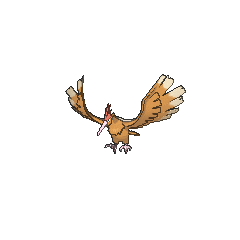 A Fearow appeared in SM003, as a silhouette. Ash captured Fearow in the first chapter, Pikachu, I See You!. It was his first capture (besides Pikachu, who was not technically captured in a Poké Ball in the manga). Ash sometimes has trouble getting Fearow to obey him. 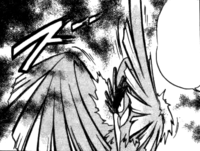 Fearow debuts in the Red, Green & Blue chapter in ...But Fearow Itself! when a wild one kidnaps a mutated Bill. It was a tough old bird, able to swiftly dodge Pika's Thunder Wave and Poli's Ice Beam (humorously causing Bill to get hit with the attacks), and even survived a Thunder from the former, after which it uses Drill Peck. Poli, however, was narrowly able to counter the move by using Double Team and landed a powerful Ice attack to incapacitate it at last. Red catches it afterwards, much to the shock of Bill. In The Coming of Slowpoke (Eventually) the Pokémon Fan Club President owns a Fearow after watching the Ninth Triennial Indigo League two years ago. It is notable that it has the move Pay Day. Later Cyrstal mentions she captured a Fearow on her way to Professor Elm's Lab in Three Cheers for Chikorita. Professor Oak also owns a Fearow that evolved from his surprisingly formidable Spearow sometime prior to the FireRed & LeafGreen chapter. In Generation IV, Fearow weighs as much as the male protagonist of the game, Lucas. It shares this characteristic with Skuntank, Togekiss, Sudowoodo, and Yanma. Onidrill is a combination of ? oni (demon) and drill. The first four syllables can be taken to mean ?? onidori (demon bird). Cantonese Chinese ?? Mojeuk Literally "Devil sparrow"
Mandarin Chinese ??? Dàzuiquè Means "Big-mouthed sparrow"